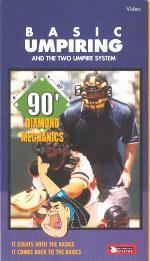 90' Diamond Mechanics is the two Umpire system for baseball, played on a regulation size Diamond with 90' bases. This video teaches you how to call and proper mechanics for...Safe, Out, Fair/Foul, Catch, No-Catch Calls...Plays at 1st, Steals, Double Plays, Jurisdiction, How to Work the Plate, Calls Balls and Strikes, clear the bat, handle pop ups, and more! You are choosing DVD format.